Our CR252 Electronic Crossword Solver from Lexibook is a remarkable product, helping you to solve even the toughest crossword clues. Armed with a huge database of over 140,000 words, this handy pocket-sized device can help you when you really get stuck, and need a little extra help. If you are still learning the art of solving cryptic clues, the pocket crossword solver can help you to gain the insights you will need to understand. 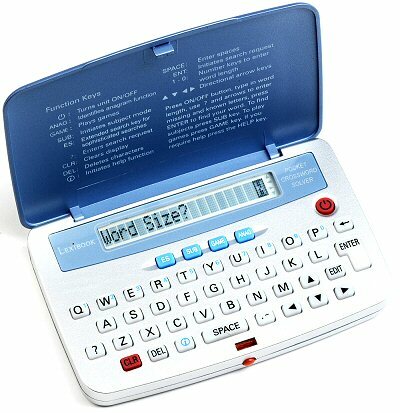 An example of one of the basic functions of this device is that you can specify the length of the word, and some of the letters that you believe it contains, and the crossword solver will then all possbile solution matches. The Crossword Solver can do more than this however, including solving anagrams. Best of all about this product is its simplicity (switch on and go), effectiveness, and very reasonable price.